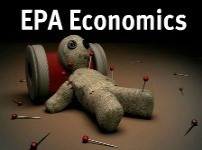 In a previous post, David Bier exposed the sleight of hand, known as partial equilibrium sector modeling, used by EPA to make the agency’s rules appear cost-effective. Partial equilibrium modeling entails an analysis of a regulation’s effect on only the directly affected industries, i.e., the regulated industry and the relevant pollution control industry, rather than an economy-wide analysis. If, for example, EPA promulgated new sulfur dioxide emission standards for power plants, then a partial equilibrium sector modelling of the rule’s economic impact would project the employment changes on the utility sector and also the sulfur scrubber industry. Such an analysis would NOT take into account the economic effects of higher energy prices. In practice, EPA invariably finds that job creation in the pollution control industry more than offsets job losses in the regulated industry. Unbelievable as it sounds, EPA’s default assumption is that each $1 million spent on pollution control will engender a net increase of 1.5 jobs, with no ceiling. Pause for a moment to let that sink in. Under EPA’s default assumption, there is no end to the employment benefits of the agency’s rules. If a given regulation costs $1 billion, it’ll create 1,500 jobs; and if it costs $1 trillion, it’ll create 1,500,000 jobs. And so on, all the way to infinity. Of course, this is plainly stupid. At the behest of Sen. David Vitter, Ranking Member on the Senate Environment & Public Works Committee, EPA has now started the process of updating its ridiculous employment analysis. To be precise, the agency is considering the use of full-economy modeling. Economy-wide modeling, if adopted, should limit EPA’s ability to pull such tricks and thereby result in a better regulatory impact estimate. In late 2013, in exchange for lifting his opposition to the nomination of Gina McCarthy to become EPA Administrator, Vitter won a concession that the Science Advisory Board, an EPA advisory body, would investigate the propriety of full economy modeling. That process has now begun. In today’s Federal Register, EPA announced it is seeking nominations to staff the Science Advisory Board. If you know of a qualified economist, one that doesn’t suffer fools lightly, then please nominate him or her. Here’s the link to the notice. I’ve re-posted the announcement in its entirety below.